I have a detail of four guards at the house. They’re very nice and have been with the house for several years. Mostly they hang out in the paillote (the straw hut, which has electricity and a concrete floor), read the Bible in Kirundi, do their laundry and come up with money-making schemes with the other house staff. The last one, a moto-taxi, was a winner until the ‘moto’ part was taken away at gunpoint. I think the next one involves micro-lending. Sometimes the guards study French, sometimes they teach math and the French alphabet to Prosper, the 14-year-old pineapple vendor. He’ll get his own post later on. I check out the guards’ equipment, presumably the tools they have to ensure my safety. There is a Motorola walkie-talkie that they turn down when they’re conducting business. Occasionally, the person on the other end plays music through the handset. There is also a billy-club, which I picked up to inspect one day; the handle was loose, probably wouldn’t withstand a strong breeze. I looked for other items but there were none. I stopped bothering to lock the door at night. I’ve also stopped using my alarm to wake up. 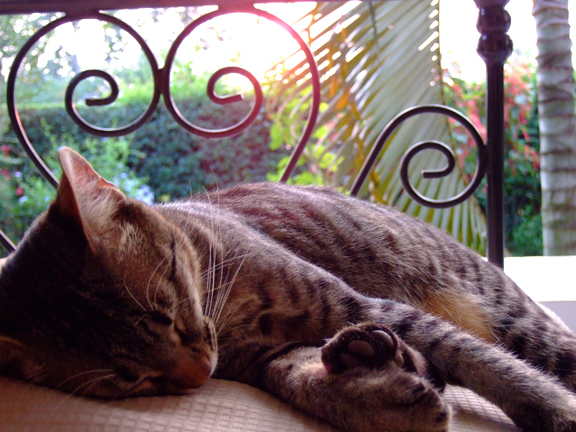 At about six every morning, LP the cat hops up into bed and walks all over me, purring/rumbling like a ’57 Chevy. Sometimes, I wake up to find him already there and I have to wake him instead. Apparently, the mosquito net is occasionally mosquito-proof, but never cat-proof. I had a dream one night that I produced a TV show along the lines of « When Animals Attack! » called « When Mosquito Nets Fail! » I woke up and was very relieved to realize it was just a dream as I scratched the new bumps on my cheeks. By 7:45-8ish – Eat breakfast, leave instructions for the house staff (if needed), and go to the office. By 8:30 –Arrive, check email, read news. At 9 :00-9 :30 – Confirm appointments for the day and check on finances/bank matters. The rest of the day is a mix of meetings and reading up on project-related materials. 7 :45 – Ready to go. 7 :46 – Guard asks if I want tea. I want tea. 9 :12 – Talk to gardener, discuss seed choices and possible projects. 9 :29 – Leave for work. 9 :41 – Arrive at office gate, speak to security guards. 9 :47 – Get into office, clear ants* off desk. 9 :48 – Clear ants off computer. 9 :49 – Read news, check email. 9 :54 – Find out appointments are either in the afternoon or rescheduled to later in the week. 10 :12 – Go to café to have croissant and coffee and to talk to Gabriel, the baker. This is a strategic decision. 10 :28 – Finish croissant. Then the meetings and errands, maybe. So far, Bujumbura has not met my enthusiasm for this project with comparable diligence. I also haven’t adjusted to the rhythm of work here yet, meaning, I’m totally flummoxed by the midday two-hour break when everything is closed and nothing gets done. Most places open at 9 a.m. and close between noon and 2 or 2 :30 p.m. Then they’re open for another two or three hours. I can’t stand the disappointment (and frustration) of going to some office or to the bank just to see the door close for several hours, so I often tell myself, I better wait. * – the ants here, they don’t really gather so much as circle, and they’re circling now. Day 17. Sunday, July 6, 2008. It’s 9 :30 a.m. and I have just found my Sunday morning activity. I’m on the soccer (football!) field, the same one from a couple weeks ago. The other team is lining up against my team – boy, everyone looks big. The referee blows the whistle to start the game. I’ll have to write a separate post about this. The first official step toward implementing a new project is to get my organization registered with the Ministry of Foreign Relations. It’s a critical step; without approval, I can’t partner (legally) with any local organizations. The registration process involves submitting a set of documents including a statement about the organization, the project outline and its objectives, the proposal budget and so on. After I did that, I realized I would never see my nice plastic folder again. That was about a week ago. I went back yesterday to check on the file. I was told that « Conseiller Félix » was now in charge of my dossier and that I should call him later. So I did and I set up an appointment for this morning at 10 :30. So I think back to yesterday, and, slowly, it comes to me. Yes, I did step on some mass of cables that was on the floor, and the printer seemed to gurgle and choke for a second, but I waited, gently patted it and made sure nothing was on fire. Everything looked okay. The woman points lazily at the USB cable port, from which protrudes a jagged metal stump. The cable connector had snapped off. Did I really do that? I think about the stories I’d heard of people in China throwing a chicken underneath someone’s car as he or she is backing out, then demanding the driver pay compensation. But, I don’t think that is what’s happening here. The woman tells me, « Without our printer, we can’t do any work. » What a pathetic start to my attempt to get registered. I can’t believe it. With one mighty stomp, I had put the Ministry of Foreign Relations out of commission. Conseiller Félix is probably in his early-forties. He wears round spectacles and an ochre short-sleeve shirt that makes me want to call him Comrade Félix. He’s looking over my file when he starts talking about how things work around here, how it’s necessary to do things right by applying the proper « lubricant. » I vaguely imagine to myself that we are talking about fixing cars. With a smile, I hand him all the documents (papers only!) that he had requested over the phone, and he cuts his speech short. He smiles broadly and says that yes, this was what he wanted to see. He looks over the program description and asks me a bunch of questions. With each answer, he nods with his eyes down and says, « Yes, then you will need to talk to the Ministry of such-and-such. » Even though I talk my way out of seeing the Ministry of Defense, I keep thinking, No! What’s the point of registering with you if I have to see everyone else? We must be having a problem with the gearbox: we’re in reverse. I see tires spinning in a sandbank. I have no ideas; I ask for directions to the other Ministries. So ends round one of a process that Félix assures me will go quickly. In my head, I start making a list of automotive vocabulary words. No, I think, but you do. 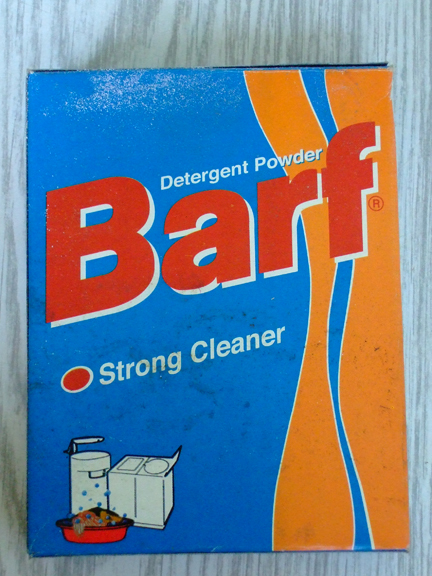 Generally, I find the game of pointing out English misapproprisms and misconstructions in foreign countries hackneyed and dull, but when I did my laundry this morning, I couldn’t help laughing hard at the brandname of my detergent. I think I find accidental and unironic misuses of language more interesting (and funny). In Kigali, I stumbled upon the ‘Commission Nationale des Recettes’, which might be the National Commission of Receipts, but I would rather have a National Commission of Recipes. A few streets down, I found the ‘Ministère de la Parole Authentique’: The Ministry of the Authentic Word. Conundrum of the last five days: a dearth of francs equals a loss in pounds. Today is my first official day of work. 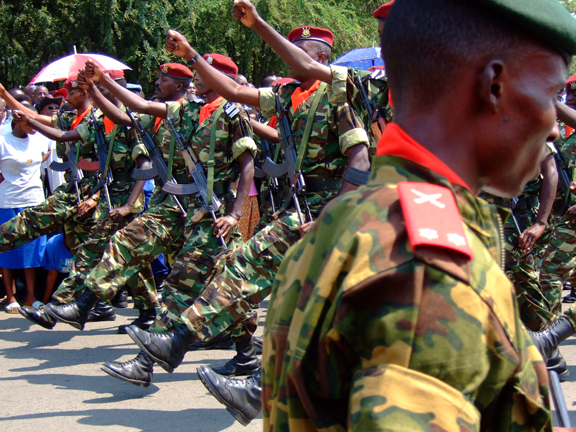 It’s also Burundi’s Independence Day. First day on the job, first day off. I walk down to the parade where the President is inspecting the troops. First the army, then the Presidential Guard, then the police. The procession is endless. It’s hot and I can’t see over the crowd. I manuever myself closer to the front and hit a wall of people. What’s strange about this mass of bodies is that it’s incredibly dense but also constantly moving – people are turning, nudging, some are leaving, others edging forward, yet I still couldn’t find an opening. At one point, I move to another area and find myself in front with a clear view of the parade, but within minutes, the crowd has swallowed me up and I find myself near the back row again. Midway through the parade, I look at the guy next to me. Poor guy, he looks so uncomfortable to be standing next to me. He is also wearing a red winter hat in the midday sun. The hat mushrooms out a bit, suggesting he is hiding a lot of hair underneath. I look at the hat’s faded logo – Arsenal F.C. (football club). I point at my Arsenal jersey and as I look from my shirt to his, I see he is wearing a Chicago Blackhawks jersey. I’m shocked. I beam at him and excitedly explain to the people around us that this is the Chicago hockey team’s jersey. Blank stares, half-smiles: why is this important? Because I’m from Chicago. More stares: crazy foreigner. And what is hockey? Hockey is a sport played on ice. Now he’s just lying. On ice? 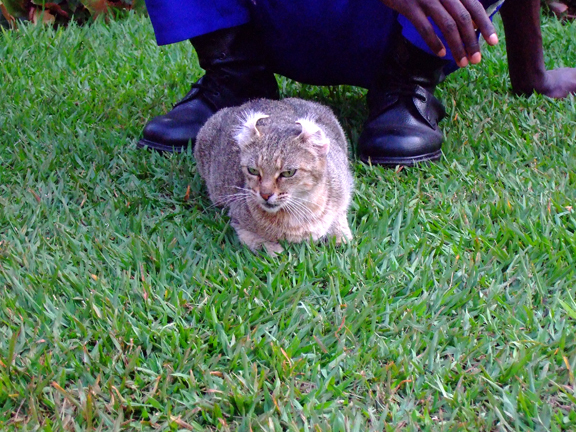 As I’m leaving the parade grounds, I spot one of the guards who works at the house where I’m staying. He’s lining up to march in the parade. We greet each other with big grins and hearty handshakes. Seeing him in the parade makes me feel kind of proud, like a parent seeing his or her kid on stage. I feel toally ridiculous for feeling that way. The next day we can’t stop laughing about seeing each other. A few people tell me that last year there were paratroopers who joined the parade from the sky. This year though they cut out the paratroopers because the government is spending less on the military now that the war is winding down. People seem disappointed. I say, « That’s the problem with peace, » and everyone nods somberly. After the parade, I’m on the side of the road listening to a couple of security guards list off all the fruits they have in Burundi when a man in a smart black jogging suit and a neat mustache (walking, of course) joins us. He hears us talking in French and asks me if I speak English. « Ego. » It just slips out. « Yes. » He says «Ah! (haha) Vous parlez Kirundi! Murakomeye ? » I say « Ndakomeye, ego. » He laughs, then says something I don’t understand. I ask one of the guards what the man said. « He said, you speak Kirundi well. » Oh. Thanks. I know where I am with the language. A few verbs and phrases; basic conjugation of present, past and future tenses; counting to a billion: I’m halfway through Kirundi 101. I’m not working with much though. I haven’t been able to locate any texts on grammar. Taxi drivers, security guards and hotel workers are pressed into service as my teachers and interlocutors. I am trying to reverse engineer a language, taking apart the words and sentences I pick up to identify some kind of logic or pattern. It’s hard to describe the process and the hopelessness of the task. Imagine being given a hamburger patty and being asked to fit it back on the cow. I figured out that the prefix si- turns verbs negative, as in sindabizi : « I don’t know. » But is that just for the first person present? (Is that even the right question?) What is the inifinitive of that verb? And why is it that when I try to conjugate a verb that has a ‘u’ in it, sometimes a ‘w’ randomly appears and sometimes not? 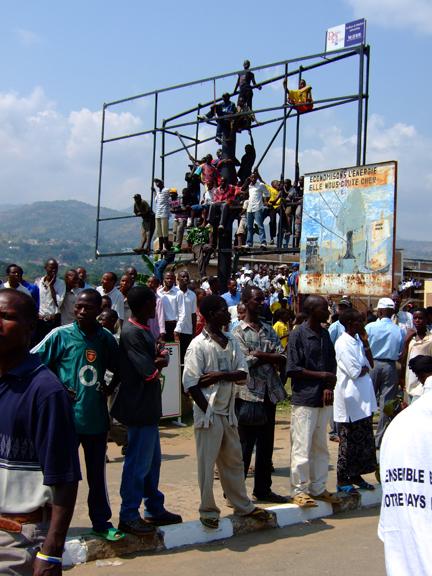 Sindabizi. I’m twenty pages into the chapter of Ishmael Beah’s memoir about his rehabilitation from being a child soldier when I finally realize that I’m trying to implement the same sort of scheme. The reason it takes me so long to make that connection is because in those twenty fascinating pages, the now ex-child soldiers are busy pillaging the rehabilitaton center, beating up staff and even fighting each other with such brutality that several of the boys were killed and adult soldiers had to be called in to break up the fighting. Beah himself hid a grenade in his shorts’ pocket and threw it during the brawl (he is very vague about whether anyone died from the explosion). I couldn’t stop reading, alternately feeling shocked at the kids’ violence and at the NGOs’ complete lack of common sense in their approach (e.g., putting child soldiers from opposing factions in the same room). Went to the Ambassador’s residence this evening for a reception for the Fourth. Was probably one of the youngest attendees. Mostly spent my time hanging out with an Embassy interpreter as he pointed out dignitaries to me. « That’s the leader of the opposition party. That’s the Minister of Defense, holding the Coke. The President? I’m not sure if he was invited. Over there is an ex-president who was ousted in a military coup. » I thought, the coup must have been really half-hearted if the putcshists let the guy get away and now he’s making friends with Americans. The Ambassador gave a speech that was long on addressing the guests and short on everything else. Four Marines did their little stomp-stomp huff-huff thing with glistening guns and billowing flags. I spent some time talking to the Ambassador’s husband, after the Ambassador told me to find him because he was interested in child-soldier issues. I tracked Gil down and it turned out he did have some very useful information. Later on, an older man chatted me up, told me he was from Russia. What he really meant was he’s the Russian Ambassador to Burundi. It was that kind of night. High point was definitely eating cookies and brownies and cookies and brownies. And one more brownie. Realizing that I’m the sole representative of my organization reveals a sad truth: I’m going to need nicer shoes. Black ones, shiny. Maybe even a suit (also shiny?). I thought I was done with having « work » and « non-work » clothes; I was excited just to have ‘clothes’ again. So much for my dream of rolling into work in sandals everyday.